The 2015 Joint Air Power Competence Centre (JAPCC) Conference was held between 23 and 25 November in Essen, Germany. It explored the broad themes of Strategic Communications with specific regard to NATO air power. 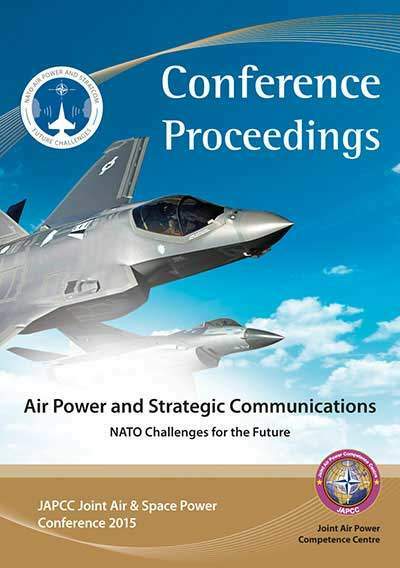 It considered whether NATO’s air power capabilities and messages were well understood and were being adequately conveyed to a variety of key audiences including western publics, defence and finance government officials and NATO ambassadors. JAPCC’s intention is to combine the views espoused at the Conference with the results of a related, ongoing academic study in order to provide NATO’s strategic leadership with fresh ideas on how this key area might be improved upon. These Proceedings consolidate the key note address, the panel discussions and attendee contributions to form a summary reference of the event and to offer points for future consideration and development. The document does not record the minutes of the Conference; rather, it highlights the major themes and draws together thoughts and ideas from all elements of the Conference. For a fuller understanding of the topic, readers are encouraged to read these Proceedings in conjunction with the previously published Conference Read Ahead material, which laid out relevant background information on the broad conference themes. It was an excellent Conference, with a wide range of participants including senior military leaders, NATO policy staff, current and former media, defence industry officials and staff from 23 different nations all contributing to this complex and challenging area. In the spirit of Chatham House Rules, no statements, opinions or ideas are attributed to any particular individual within this record.